Play of the Day: Buddy unbelievable! FULL TIMEThe Swans have beaten the Dockers by 24 points, booking a spot in the preliminary final. The Dockers play a home final next week, against either the Power or the Tigers. BEHIND SWANSJetta marks on the 50, he has a shot on goal and he is offline. GOAL SWANSHannebery gathers the ball inside 50, has a shot on goal and there is the sealer. The Swans are through to the preliminary final. Fyfe marks inside the 50, he plays on and has a shot on goal, but as he was about to kick the ball, he was pushed off the ball, as he was having a shot. Crozier drops the mark he should have taken, after Shaw was hot on his hammer. The Swans clear it away from the backline. 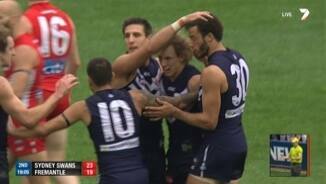 The Dockers equation looks like this, score three goals in four minutes to win the game. The Swans just need to ice the clock down. BEHIND SWANSJetta takes a quick shot from the boundary line, but it bounces the wrong side of the goal post. BEHIND SWANSFranklin takes the mark from the 50m line, he takes the set shot on goal and misses. Time is now becoming a factor that is playing against the Dockers, they must score and do it in a hurry. BEHIND SWANSGoodes takes the mark 45m from goal on the boundary. He comes in and he pushes the ball away to the left for a minor score. BEHIND DOCKERSSandilands taps it straight down to Neale, he kicks straight away for goal and pulls it away to the right for a point. GOAL DOCKERSWalters takes a strong overhead mark, as he picks himself up from the floor, he plays on 25m from goal and he breathes some hope back into the Dockers. The Dockers won't give up here, as they continue to challenge the Swans for the title of advancing to the preliminary final. BEHIND DOCKERSDuffield takes the mark 45m out on a slight angle, he hooks it away to the left for a point. There is more than enough time left on the clock for the Dockers to win this, but it means that they will need to start kicking some unanswered goals. GOAL SWANSPyke runs back towards goal, as Goodes skies the ball for Pyke's advantage, he gathers it and he splits the middle. The winner of this contest will have a week's break and book a spot in the preliminary final. 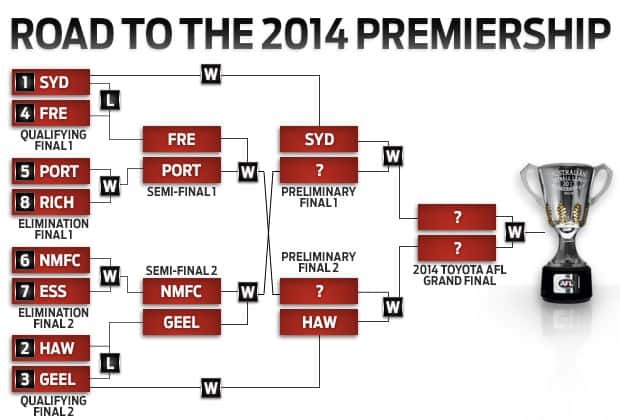 The loser will host a final next week against either Port Adelaide or Richmond. GOAL DOCKERSSandilands taps it down straight to Mundy, who slams it onto the left boot and kicks a much needed Fremantle goal. BEHIND DOCKERSSandilands with a quick shot on goal and he is offline. GOAL SWANSFranklin runs into the 50, after gathering the ball from Jetta, he kicks it for goal and he splits the middle. Is there anything this man can't do? BEHIND SWANSPyke kicks a bouncing ball for goal, it appears it is touched on the line. It is referred for a score review. It is a confirmed behind. GOAL SWANSFranklin gathers it 70m from goal, he is not distracted by the distance as he he heads for goal! BUDDY!!!! What a goal! GOAL DOCKERSWalters slaps it into the path of Pavlich and he snaps at goal. He kicks his fourth goal of the game. Look out Swans! GOAL DOCKERSSutcliffe sends it towards goal and gives the Dockers just the start that they wanted. We are back for the final term, as the Dockers have first use of the ball from the middle. THREE QUARTER TIMEThe Swans have opened up in the third quarter and lead by 22 points at the final break. GOAL SWANSJack is legged just inside 50 and is paid the free kick. The shot for goal is a beauty! That is a heart breaker! Swans by 22 points. BEHIND SWANSJack turns it around the body and he just misses. Swans by 16. GOAL SWANSA crucial mark by Goodes just inside 50. He has hardly been sighted all match but could make a difference here. HE DOES! Great kick by Adam Goodes. Swans by 15 points. It's not a game for the big men with all the big forwards bar Pavlich having minimal impact on the match. SUBSTITUTION DOCKERSThe Dockers have activated their substitution with Crozier coming on for Danyle Pearce. It's a low scoring affair but it's very high stakes here at ANZ Stadium. This is one gigantic battle and it's a thrill to watch every plot. BEHIND SWANSHannebery is paid the free kick for a push but it's a tough kick. Hannebery sends it on its way but it never looks likely. 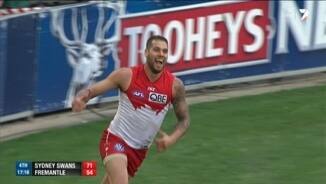 GOAL SWANSJetta marks a blistering fast coast to coast move by the Swans only 20 metres out. Jetta takes care of business and the crowd are getting right behind the Swans. BEHIND DOCKERSBallantyne has the ball deep in the pocket near the sticks and it's a great goal saving tackle by Rampe to spill the ball and concede the rushed behind. GOAL DOCKERSKennedy's kick out of defence is charged down by Ballantyne. He handballs over to Mzungu who makes him pay the ultimate price. The Dockers strike back! BEHIND DOCKERSGrundy is tackled dangerously close to goal. The ball spills out and Walters' opportunistic kick for goal bounces to the left. GOAL SWANSMcGlynn takes in a few deep breaths and kicks the goal. 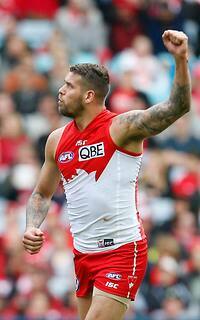 He has three goals and the Swans hold a ten point advantage. The Swans have just entered their fifty for the second time of the quarter and McGlynn is paid the free kick for a high tackle. The Swans are handling the best the Dockers can dish out to them at the moment. A goal or two against the run of play could break their hearts. The Dockers keep hammering the ball inside 50 but they cannot make an imprint on the scoreboard. You feel they need the next goal. We are expecting more rain here in Sydney and if that prevails the common thinking is that it will favour the Dockers. BEHIND DOCKERSBallantyne gets down low to take the mark. His kick for goal isn't as good for the Dockers. We are off and underway in the third quarter. HALF TIMEIt's the match we were all hoping for. Half-time and the Swans lead by 5 points in a very tough and bruising encounter. We can't wait for the second half. GOAL DOCKERSIt's three vs one, three defenders vs Pavlich. The skipper gets his boot to the ball first in the goal square and he kicks a remarkable goal! GOAL SWANSA big mark taken just outside the goal square by Tippett. He is awarded a 50 metre penalty and this one is a formality. Tippett slams it through and the Swans increase their lead to 11. The Dockers are defending desperately and it is a battle of the toughest out there. One of these teams will have to back up next week and they will be sore and sorry. BEHIND SWANSTippett looks to end the goal drought but his effort at goal is out badly to the left. We have not had a goal in over 15 minutes. BEHIND DOCKERSFremantle work it coast to coast once again. Mayne takes the mark but his shot for goal from 45 metres out misses to the left. BEHIND SWANSParker bursts through and fires for goal but he misses to the left. BEHIND SWANSA rushed behind for the Swans with the Dockers defence under pressure. BEHIND DOCKERSPavlich claims the mark but it isn't paid. Taberner hurries the kick for goal and he misses to the left. We haven't had a goal for a while with the contest really tightening up big time. Malceski's removal from the game just about squares up the Dockers' loss of Johnson with both teams depreived of their rebounding defenders. It has been even tougher in this second quarter with both teams trying to make an impact with intensity galore. SUBSTITUTION SWANSNick Malceski is out with his hamstring. He is replaced by the Birdman! Craig Bird that is. GOAL SWANSAnother lead change with McGlynn marking in the pocket and guiding it through. Very nice kick and the Swans take back the lead. GOAL DOCKERSFremantle turn defence into attack in an instant. Mayne handballs onto Pavlich who steadies and kicks a beauty from 45 metres out! BEHIND DOCKERSA rushed behind to the Swans thanks to the efforts of Dawson who barges through to cut out Reid's chances of kicking the goal. QUARTER TIMESydney hold a slender three point lead after an even and hardly fought first quarter. Some concerns on the Swans bench with Nick Malceski getting worked on. He appears to be walking freely for now. The intensity is very high out there and the umpires are happy to let it go as a whole. GOAL DOCKERSFyfe works Parker underneath it and he takes a good contested mark. With his tenth disposal he kicks the goal and the Dockers are back to within three points. BEHIND SWANSFranklin is taken high again in the marking contest and is paid another free kick. Franklin's kick looks good off the boot, but it fades late. Sydney definitely has had more of the football but the Dockers have used it better when they've had it. There is a display of good tough finals football out there. The conditions aren't the best but the footy certainly is! GOAL SWANSMcVeigh draws the opponent then handballs to McGlynn who runs in and slots it through. Good footy Sydney! GOAL DOCKERSRohan turns it over allowing for the kick to go to Pavlich. He marks, takes a couple of bounces and kicks the goal. GOAL SWANSThree goals in the match thus far with all of them coming from free kicks. This time Parker is thrown off the ball. He doesn't wait and gets on with it to maximum effect. GOAL SWANSSilvagni spoils Franklin but does so illegally going over the shoulder. Franklin loves it from near the boundary. This time is no exception. Great kick! GOAL DOCKERSRohan runs out of defence but he runs too far without bouncing. Free kick to Mzungu! From 50 metres out Mzungu goes BANG! Dockers in front. 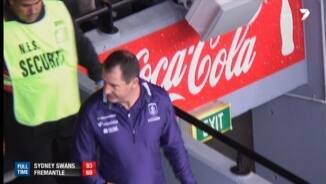 Ross Lyon already looking animated in the coach's box as things go against the Dockers early on. BEHIND SWANSAnother shot comes firing in from the Swans and this time Malceski's shot bounces into the post. BEHIND SWANSIt's been all Sydney early on with Jack's shot just missing. BEHIND SWANSSydney get it out of the middle and the Buddy takes the mark on the lead. He lines it up but he misses to the right. We are off and underway in Sydney. The first week of the finals continue with Sydney hosting Fremantle from ANZ Stadium. One late change for Fremantle with Crozier coming in for Griffin. The substitutes are Bird and Crozier. HE LEFT it late, but Lance Franklin still had plenty of time to shine, producing two moments of magic as the Sydney Swans recorded a 24-point victory over Fremantle to secure a home preliminary final. Franklin had just 1.2 on the board up to three quarter-time, well held by recalled Dockers defender Alex Silvagni, but the first-year Swan kicked two critical final-quarter goals in their 13.15 (93) to 10.9 (69) triumph. 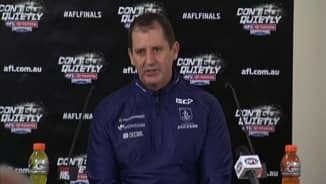 Moved into the middle by coach John Longmire, who got the better of his old sparring partner Ross Lyon, Franklin responded by first kicking a booming goal from more than 60m that halted a Fremantle charge. He then got loose in the left pocket and slotted the ball on the run from an acute angle that gave the Swans a 22-point lead in front of 35,998 fans at ANZ Stadium. "We just thought his kicking ability up through the middle of the ground – he's a beautiful field kick as well as a kick for goal," Longmire said of Franklin after the game. "His speed, plus taking away their reference point where their extra (defender) was going, he got involved and was pretty hard to stop when he's running around like that. "And he can kick it from so far out, it was a combination of all those things, and it worked OK."
Buddy finished with 18 disposals, seven marks, 3.3 and the game's eye-catching highlights in a largely dour, intense contest, but he still needed plenty of help to get the Swans over the line. Luke Parker (32 disposals), Dan Hannebery (27), Ben McGlynn (three goals) and Lewis Jetta (25 disposals, seven inside 50s) were all crucial as the flag favourites earned a week off and a home preliminary final in two weeks. But the outcome remained in doubt until well into the final term, with the courageous Dockers refusing to yield on a grey, wet Sydney day. Missing a host of key personnel, including key defenders Luke McPharlin and Michael Johnson, the Dockers never stopped coming and were within 15 points after a Michael Walters goal 19 minutes into the final term. But they fell short, leaving them facing a home game next week against the winner of Sunday's match between Port Adelaide and Richmond. Matthew Pavlich (four goals), Michael Barlow (28 disposals), Nat Fyfe (29) and Tendai Mzungu (21) all contributed to a Fremantle side that, on this performance, will still feel it can have a say in September. 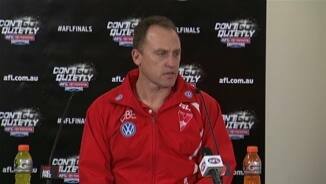 But the Swans' extra polish meant they have given themselves the best chance of reaching a second Grand Final in three years. The only negative for the Swans was an apparent hamstring injury to Nick Malceski in the first quarter, forcing him to be substituted out of the game, replaced by the returning Craig Bird. Malceski is considered a likely All Australian this year and his loss denied the Swans one of their main avenues out of defence and could have greater implications for the rest of the finals series. Nearly twelve months after being suffocated by the Dockers' pressure in the first half of last year's preliminary final in Perth, the Swans made an impressive start. Franklin was prominent, kicking 1.2 for the term, although the Swans were looking for him a little too often and the Dockers were able to double team him and nullify some of his influence. Fyfe was exceptional in the quarter, picking up 10 touches and a goal, while Garrick Ibbotson was playing an important floating role in defence. 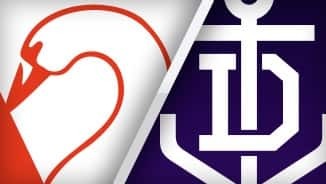 Pavlich kicked his second early in the second quarter to put the Dockers back in front, quickly answered by McGlynn's second, before the game tightened up and no goals were kicked for 20 minutes. It was finally Kurt Tippett that broke the stalemate, taking a grab in the goalsquare and kicking truly, before Pavlich's third made it a five-point game at the main break. At half-time the Swans were leading the disposals, tackles, inside 50s and clearances, but hadn't made it count on the scoreboard. In the third quarter, however, the home side finally put its foot down. Fleet-footed duo Jetta and Gary Rohan were critical as the Swans lifted their intensity and kicked four goals to one for what looked a match-winning 22-point lead at the last change. And so it proved, with the Swans doing enough to keep their charge for another flag well and truly on track. Lyon felt his midfield had finished second on the night and could also only offer his appreciation of Franklin's abilities. "I thought our forwards were opportunistic, the little amounts of opportunities our midfield gave them, and I thought our defenders defended pretty well under siege," he said in his assessment of the game. "Half-time we dominated the entries 14-9, but you can't drop marks and miss opportunities and they got some opportunities they took late that gave them the lead. "We dared to win in the last quarter, got some real ascendancy, couple of errors and Buddy's class – a goal from the boundary and a goal from 55 – and they held sway. "But we never stopped trying."